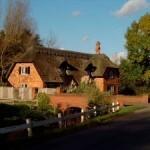 Home » Bed & Breakfast News » Bed and Breakfast Blog » Great British Fountains! Dating back as early as the end of the 17th Century, fountains started out almost as a decorative ‘status symbol’ of the English Country House, and then with the development of the steam engine in the 19th Century, this technology allowed the imagination to flow as fountains could be designed with increasing dramatic creativity. Built to impress Czar Nicholas, on a scheduled visit in 1844, (which incidentally never happened! ), this incredible fountain, located in the beautiful grounds of Chatsworth House. 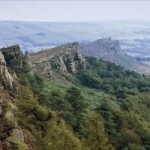 It is one of the most popular attractions in Derbyshire and can reach amazing heights of 60 m (200 ft). Also not to be missed is Chatworth’s Cascade, an impressive sight of water flowing over a series of elegant stone steps in the hillside east of the house. This fabulous fountain, having undergone major restoration by English Heritage, is a sight to behold. Considered one of the grandest fountains in Europe, it forms the centrepiece of the Witley Court Estate. Hot off the press for 2017, the Lower Terrace (Queen Victoria’s private garden terrace), at Osborne House on the Isle of Wight, has now been opened to the public for the first time. The Andromeda Fountain, having undergone a major restoration, forms the spectacular centrepiece. 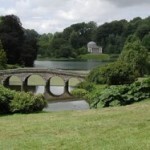 Visit the stunning stately home of Blenheim Palace, situated in 2000 acres of beautiful parklands and formal gardens, including the striking Water Terraces and the Grand Cascades. 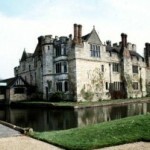 Whilst it might not be a fountain, we thought that the Water Maze at Hever Castle was worth a mention. Located on a 16 acre island, the maze follows a series of stepping stone walkways, but watch out for those hidden water jets!